After installing my orange pi zero. I tried to use my board the reencode some video file that use xvid/ac3 to x264/aac with the ffmpeg linux command. The problem was that it took more than two hours at 100% cpu usage on the 4 cores to reencode the video, during that time the cpu was getting instantly too hot and, as a result, was heavily throttling . I tried to use a radiator, and it significantly reduced the amount of throttling but it was not eliminating it, since eventually the cpu reached pretty high temperature. I decided to add a fan to blow on the radiator to reduce even further the cpu temperature. I didn’t want the fan to be running all the time so I decided to use the gpio function of my board to control the state of a pin to start and stop a fan. The problem is that the logic levels sent by the gpio is 3.3v which is much to low to start the fan i own. Of course, this is not going to be OK. I must find a way to start that fan without that initial push. To send 5v instead of 3.3v to the fan I used a PNP transistor that will be controlled by the 3.3v signal. As you can see on the photo, the pin one of the PNP transistor is wired to a GPIO pin, the pin 2 is wired to the pin 2 of the board which provide constant 5v,and then the pin 3 is wired to the the red wire of the fan. The black fan wire is connected to the pin number 6 of the board. Here is a little schematic of the wiring. At first I tried to use the gpio pin number 23 but, for some reason I failed to change the state of that pin using the wiring pi library. I then chosed to use the pin number 7 which is named GPIO.7 in the “gpio readall” command. But even with all that, my fan still needed a little push to start turning. 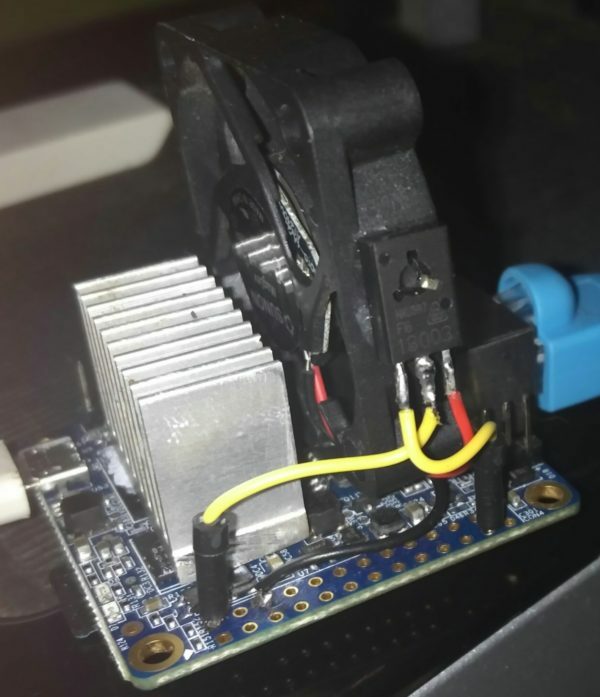 After a good afternoon where I considered buying a cheap and small 5v fan on one of the classic Chinese website, i remarked that if my control GPIO pin was not soldered and I disconnected and reconnected very rapidly the control wire, the fan was starting every time. The idea of a bash script exploiting this fact was born. Here is the script that works for me every time! This script put the pin 7 in output mode, then switch the state of pin 7 rapidly provoking the startup of the fan. At the end of the script the pin 7 is left in the 1 state. To be sure the fan started, I usually launch this script 3 times, but it’s overkill and one time is enough most of the time. Now creating a script that launch automatically the fan when the cpu get above a predefined temperature is going to be extremely easy, I will describe it in another article. I’m surprised that worked. Your fan should not get more voltage than the GPIO output minus the transistor’s B-E drop, that is 3.3V – 0.6ish V, around 2.7 volts (But it will amplify the current). To wire it correctly with an NPN transistor as a switch like this, your fan should be between the transistor’s collector pin and the +5 volt. It won’t get exactly 5V, but a little bit lower due to voltage drop over the transistor’s C-E pins, depending on the transistor. Also, important, use a resistor between the GPIO output and the base pin on the transistor. At least a few 100 ohms, or maybe a few k-ohms, hard to say, depends on the transistor. And the output current capability of the GPIO. 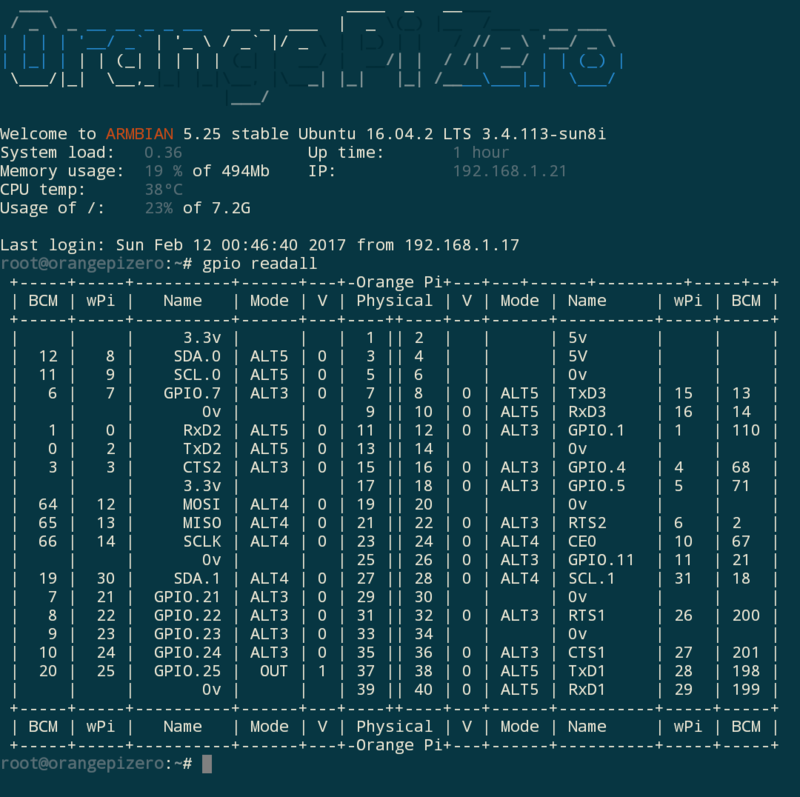 Which, incidentally, I don’t know what is, and I’m completely new to the Orange Pi Zero btw (literally just logged into it for the first time, and my lacking google-fu about GPIO pins brought me here lol). In short, just google “transistor as a switch”, and you should be set. You are 100 % right! Can you please explain me the purpose of the resistor between the gpio output and the transistor gate? 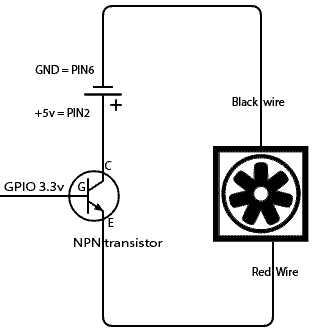 The resistor between the GPIO and the Gate is known as a current limiting resistor. It’s there to ensure you don’t exceed the current supply capabilities of the GPIO pin, typically 5-20ma.